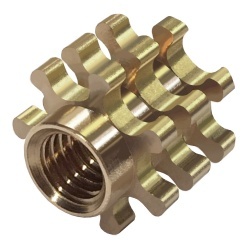 Brass is the standard material for threaded inserts. Bras threaded inserts are economical, available in the wideset range of sizes, easy to install, and resistant to corrosion. In more demanding applications you may want to look at our range of stainless steel threaded inserts. Here are some of the brass threaded inserts that we have in stock. If we do not have the brass threaded insert that you need, please contact us so that we can manufacture it for you.